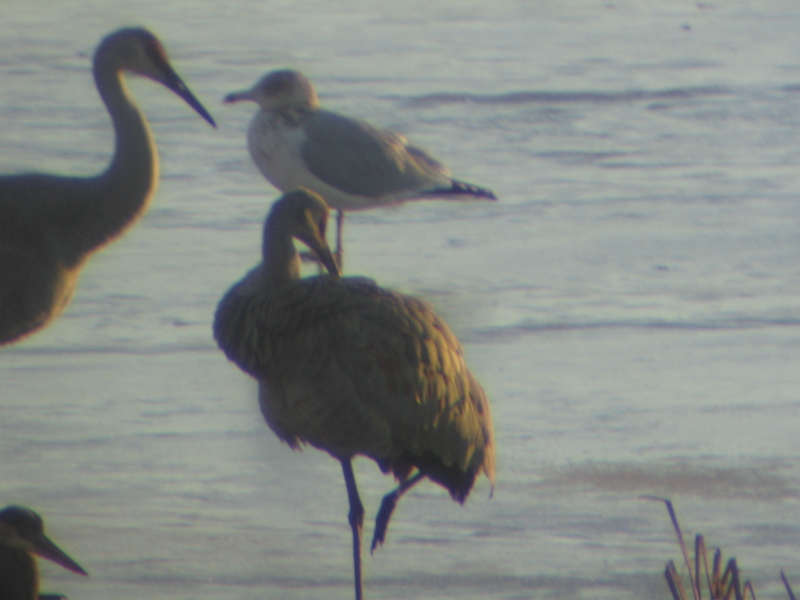 January’s bird of the month was the pair of Sandhill Cranes at Crescent.What a thrill to see them so close up. February was gull month. 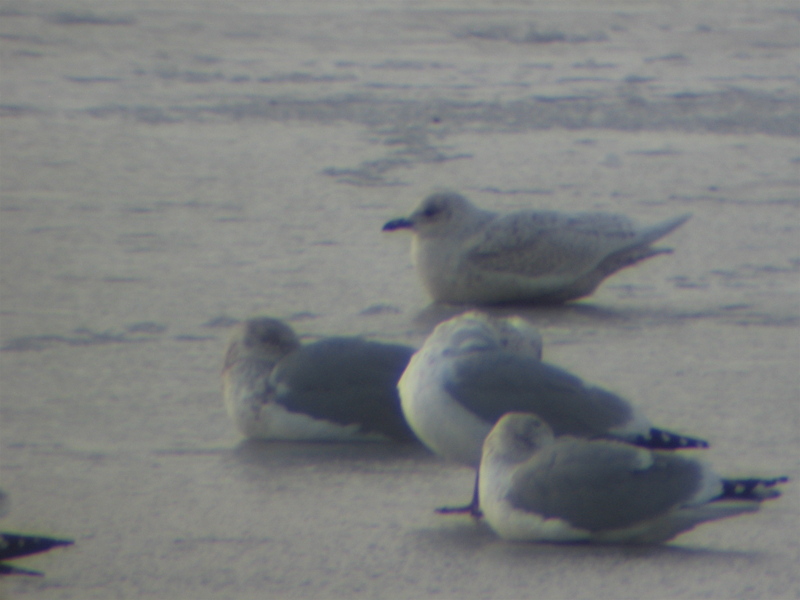 I added three lifers to my list: Iceland Gull (below, with 3 Herring Gulls), Lesser Black-back, and Glaucous Gull, plus Little Gull in July. They really aren’t all the same! I begin to understand Laridaephiles! March is the first stirring of spring, bringing the earliest Blackbirds and Tree Swallows. Waterfowl are on the move! There’s nothing better than April for a birder. Everything is coming! Almost as birdy as May, and fewer bugs! Tree and Chipping Sparrows switch places again. The earliest Warblers flit through the still-bare treetops. Shorebirds are bolting north. 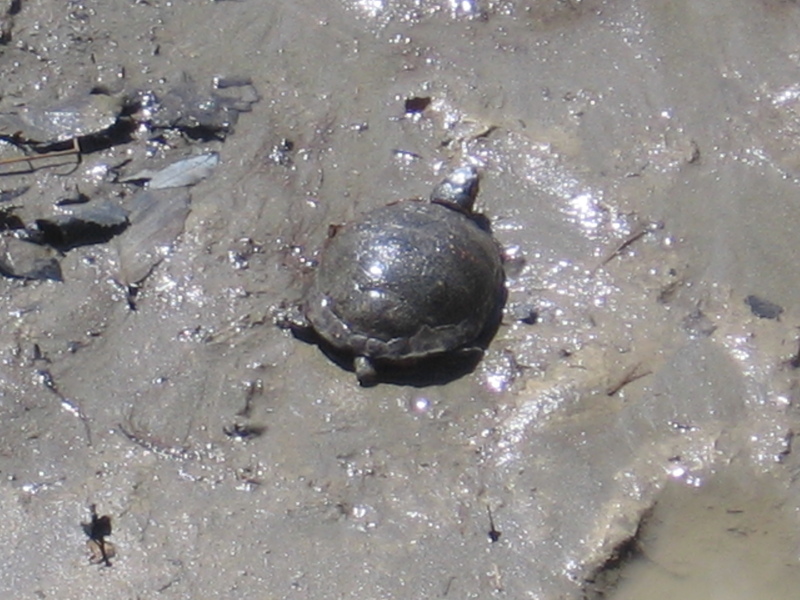 And herps are making their own short migrations. All right, I take it back about April. May. May. MAY. Every day brings new migrants, new nesting birds, so many colors and voices there’s no time to blog or photograph or even think, sometimes. It’s all I can to to absorb every brilliant moment. 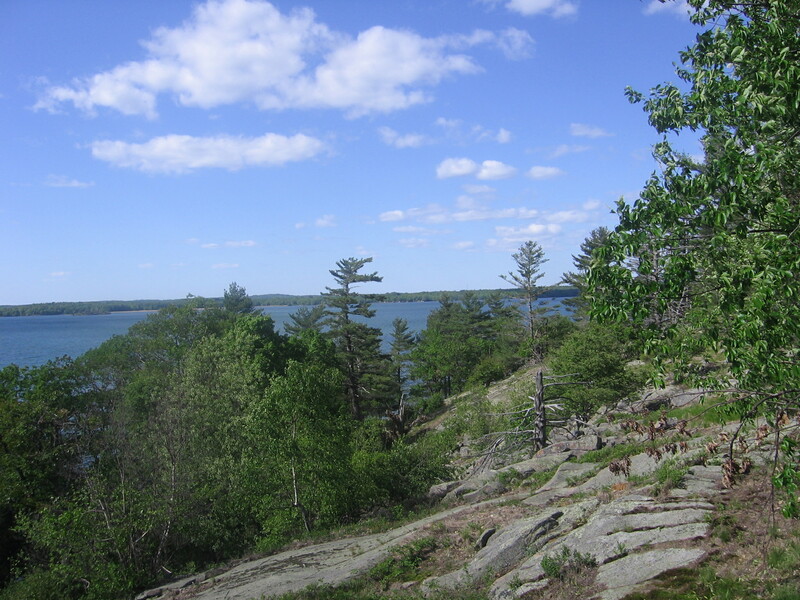 I saw my first Hooded Warbler, my first Golden-winged Warbler, my first Vesper Sparrow. I heard a King Rail! Hummingbirds, Orioles, Swifts! These trees were dripping with warblers. June, and things are calming just a bit. The residents are settling down to the business of nesting. 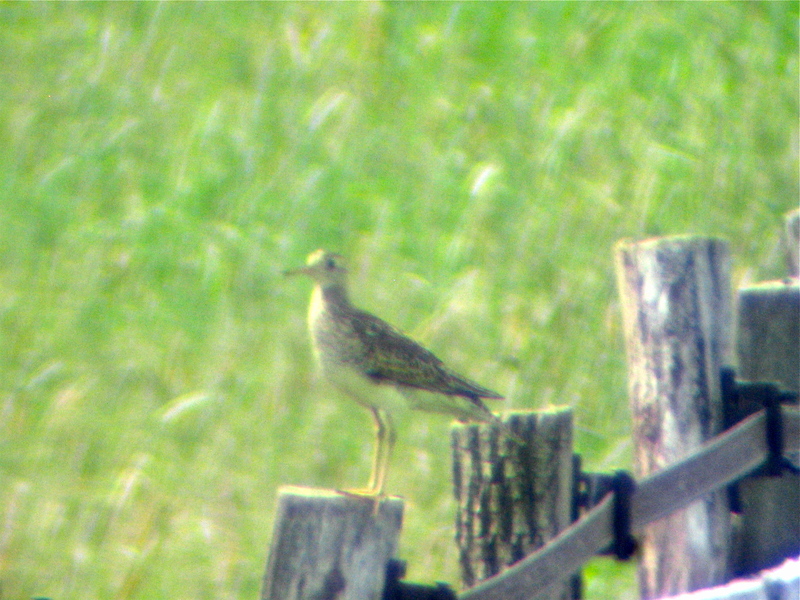 A field trip to Montgomery County showed me an Upland Sandpiper, doing exactly what an Uppie is supposed to do — pose on a fencepost and whoop his wolf whistle. A side trip to the neighboring town of Root produced a surprise — a Clay-colored Sparrow singing from the top of a shrub! 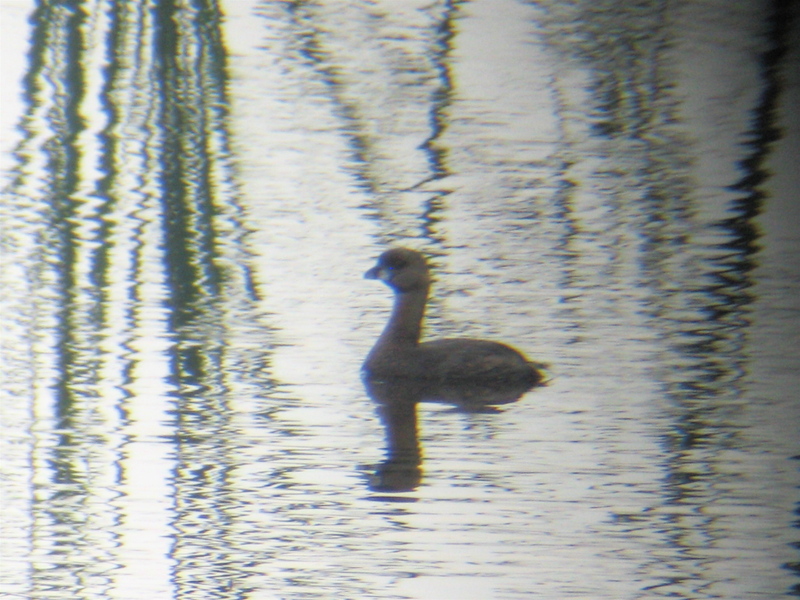 A two-lifer day! July is the time to settle in and do some birdwatching, instead of birding. See fuzzy-headed fledgelings at the feeders, Tuftless Titmice and short-tailed Catbirds begging and nagging. 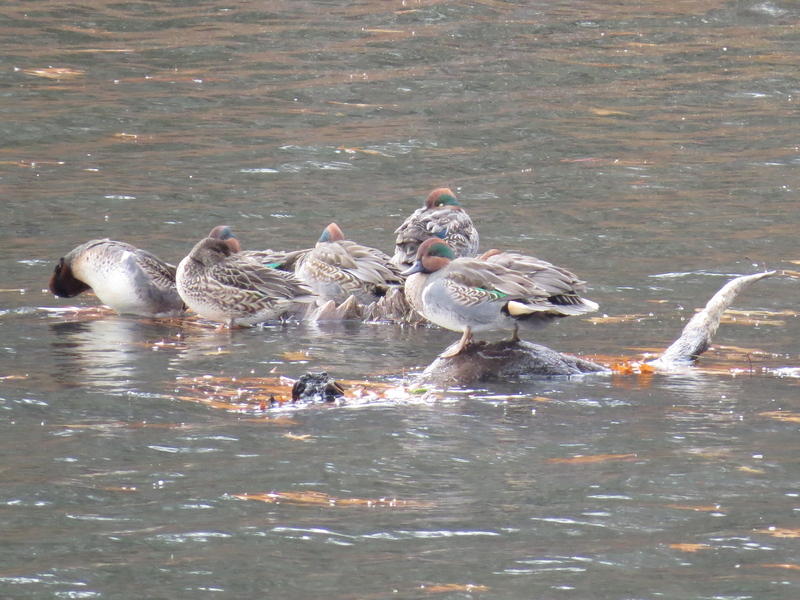 Some of the territorial sniping has calmed and birds, like us, are just hanging out at the lake trying to stay cool. Hey, is that a Grasshopper Sparrow? Lifer! For shorebirds, August means summer is over and it’s time to head south from their far-north nesting grounds. I caught this Sanderling on a rest stop at Cohoes. The surprise of the month was a pair of Red-headed Woodpeckers in the Albany Pine Bush, first I’d seen since moving up here. And after seeing my first pair ever of Cliff Swallows, I looked carefully at the power lines on my road and found a new yard bird, too. The warblers sweep back down in September in ‘confusing fall warbler’ plumage. Look carefully, and you can pick up species missed on the way up. I found my Philadelphia Vireo that way. Fortune favors the prepared, they say. 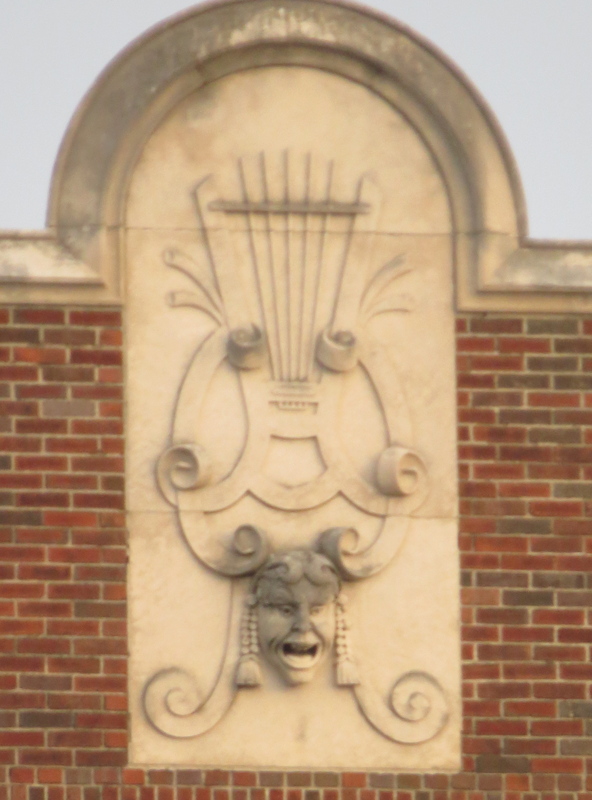 I’d been looking for a Philly to complete the category, and so I was ready when I saw him — another lifer. The (white) Little Blue Heron was a surprise, though. In the style section, Pirate Birding was all the rage. October, the month of mist and spiderwebs. 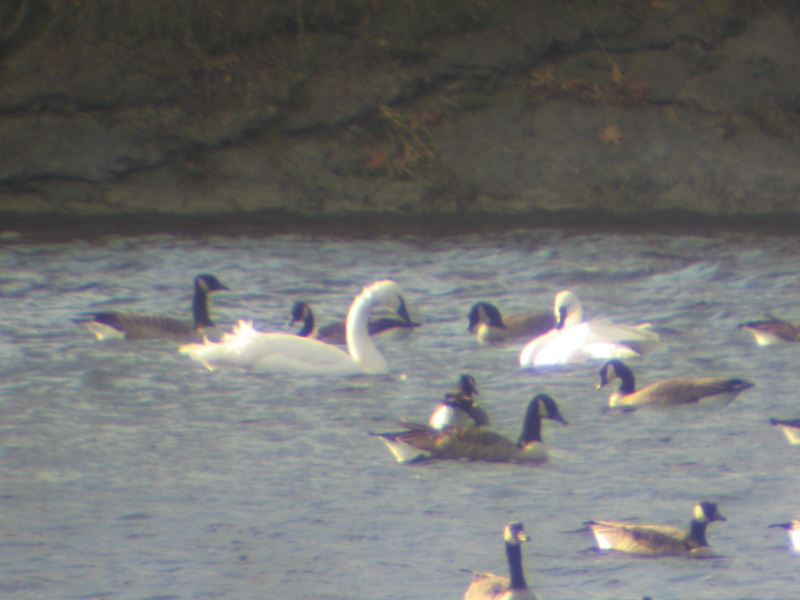 Unexpected birds like these Tundra Swans show up with migrating waterfowl. Here one day, a hundred miles south tomorrow, any sighting pure chance. November’s big goal — I swore that this winter I would see a Short-eared Owl, if I had to pitch a tent on Fitzpatrick Road to do it. And I did! (See the owl, that is, not camping on the old tent-ground.) And up in the Adirondacks I caught glimpses of Boreal Chickadees, just as adorable as their Black-capped cousins. But the number of species has dropped by a third since last month, and I swear I recognize every beak at the feeder. Still I have something to be thankful for– a new camera, and better photos to look forward to sharing. December — it’s Christmas Bird Count time! Pray that good bird hangs around until count day! Hope it flies over my sector instead of crossing the river! Swap tall tales of CBCs present and past, and how easy we young punks have it today — the old timers birded on foot! in the snow! barefoot! uphill both ways! just to score every Blue Jay! 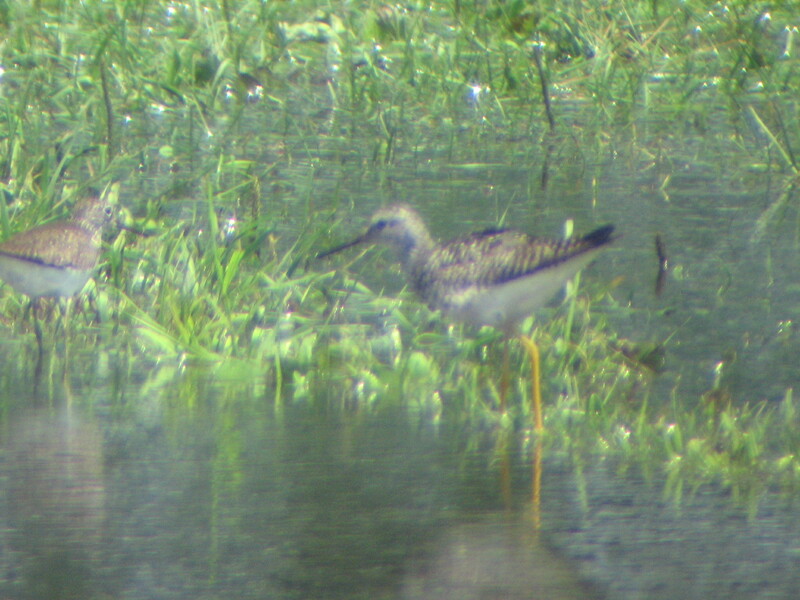 And sometimes (whisper it) ditch your count for a bird so cool you just have to see it. So I end the year the way I started it, with a big charismatic bird that doesn’t mind being gawked at. 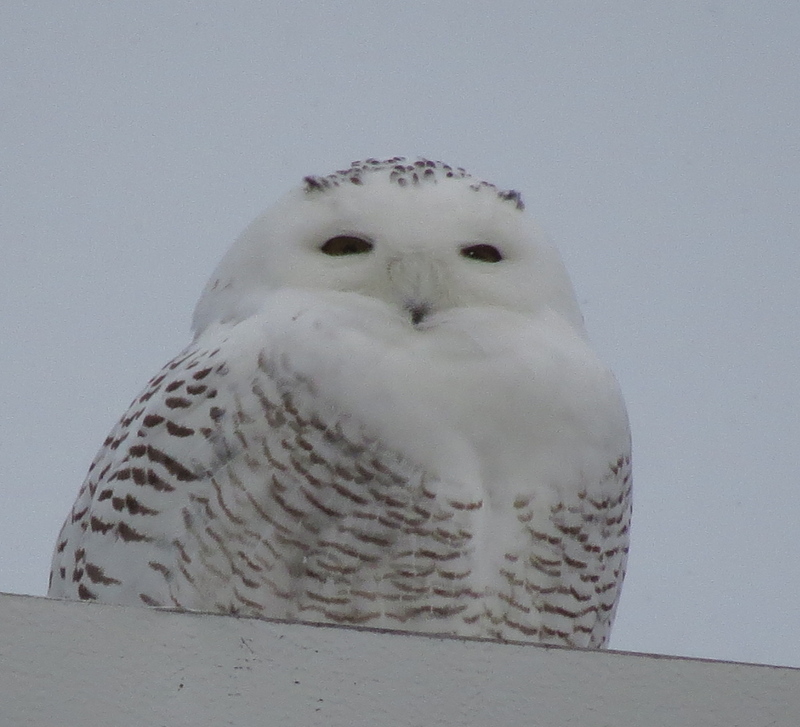 Schenectady count and … OMG SNOWY OWL!!!!!11!!!!!! It’s cold. Wicked cold, snot-freezing cold, why-didn’t-I-stay-in-bed cold. 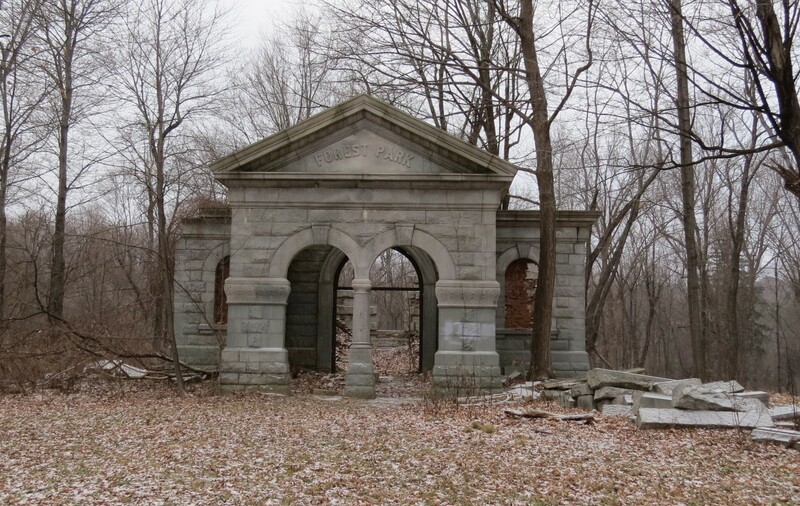 But it’s opening day of Christmas Bird Count season, and I was off to Schenectady County. At 8°F, pigeons huddled for warmth on light poles. 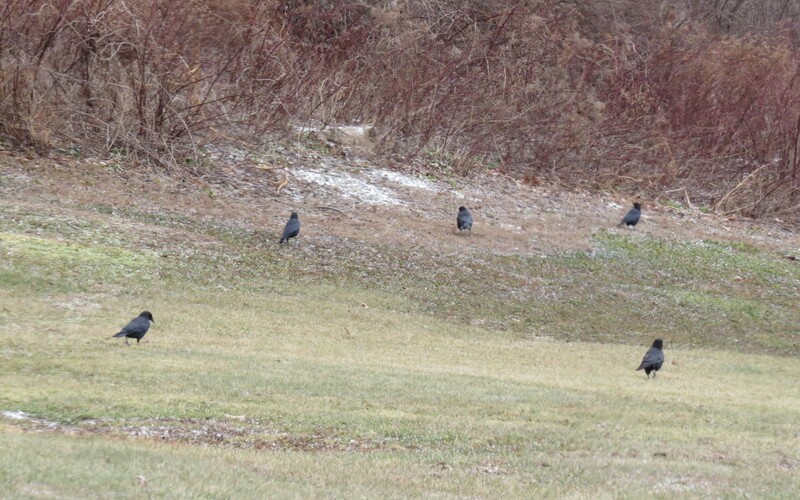 As the sky brightened a few birds ventured down to the pavement, joined by others from across the lot. 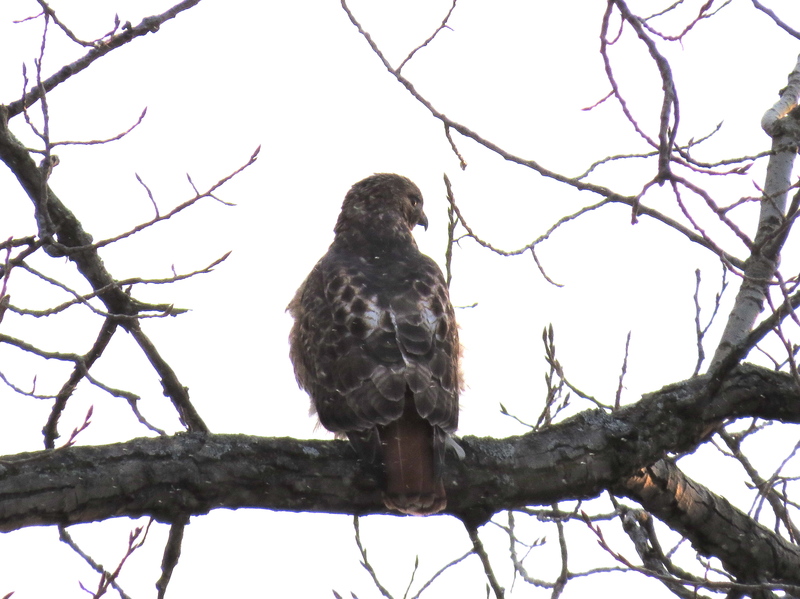 When they all erupted into the air, we realized one of the ‘pigeons’ was a Cooper’s Hawk. It gave up the attack quickly and swung off into a tree. And we started our route. Things settled into a routine pretty quickly. Cruise slowly along the road, windows cracked for chip notes, get out, stand around stamping our feet, jump back in the car and crank the heat. Repeat, adding a few birds at a time for a few hours. It seemed to be getting colder as the morning wore on. The birds had better sense than the birders. 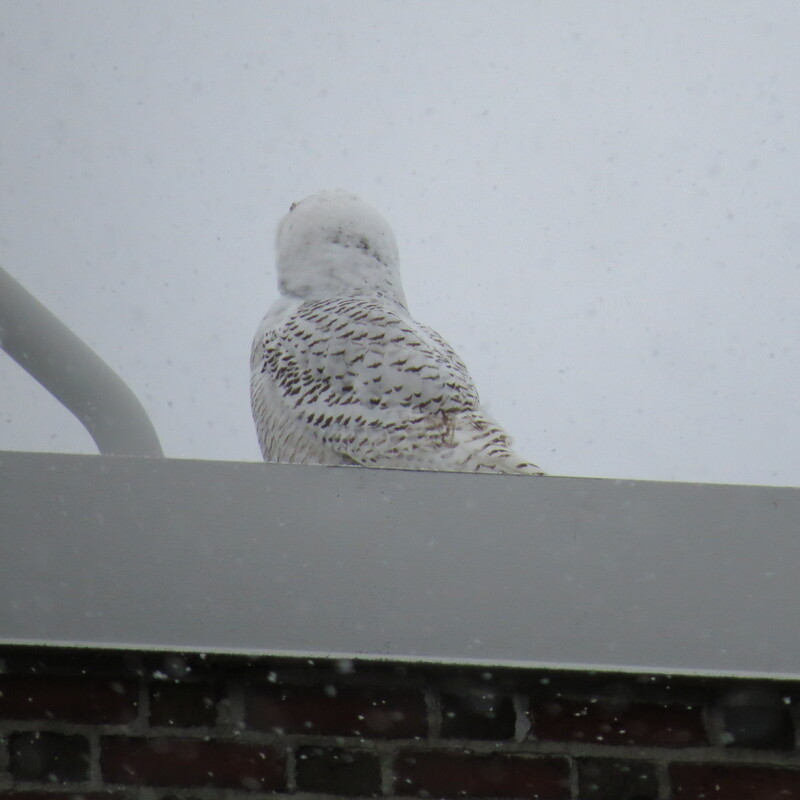 Then the news raced across the local list — Snowy Owl at RPI! I recognized the location right away. All the times I’d driven my kids to classes there finally paid off! 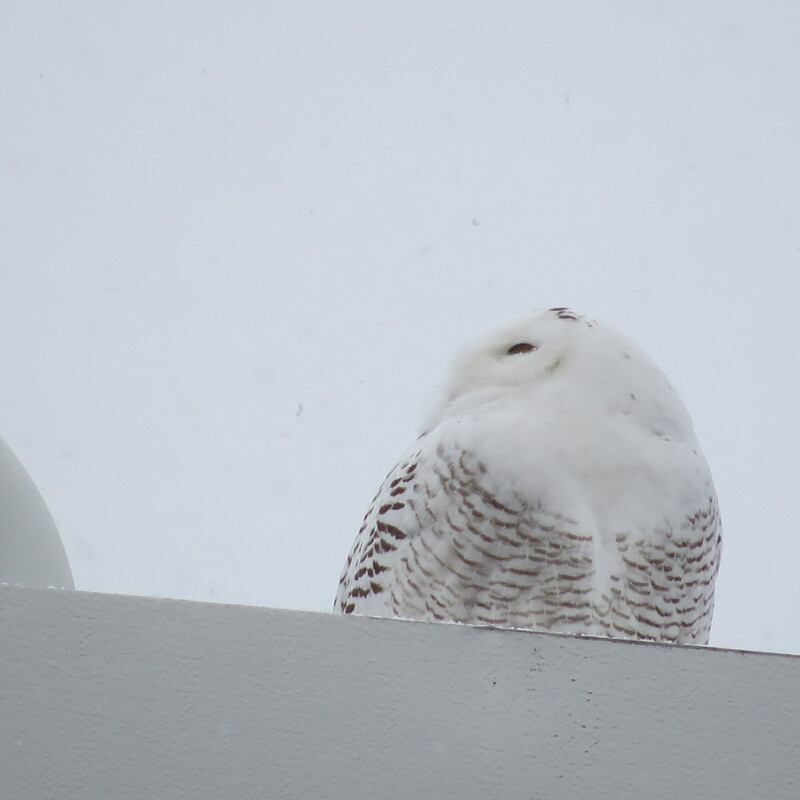 I decided to bail from the count, and the count followed me across the river to Troy where right where he was supposed to be was a beautiful immature male Snowy Owl. He gazed around looking sleepy. Cars entered and exited the parking lot, birders gathered and oooohed and gazed. The only thing that caught his interest was a vehicle squeaking like a tremendous rodent. For that, he opened his eyes. Until a pigeon darted by. He followed the bird’s flight, turning his head nearly 90 degrees. 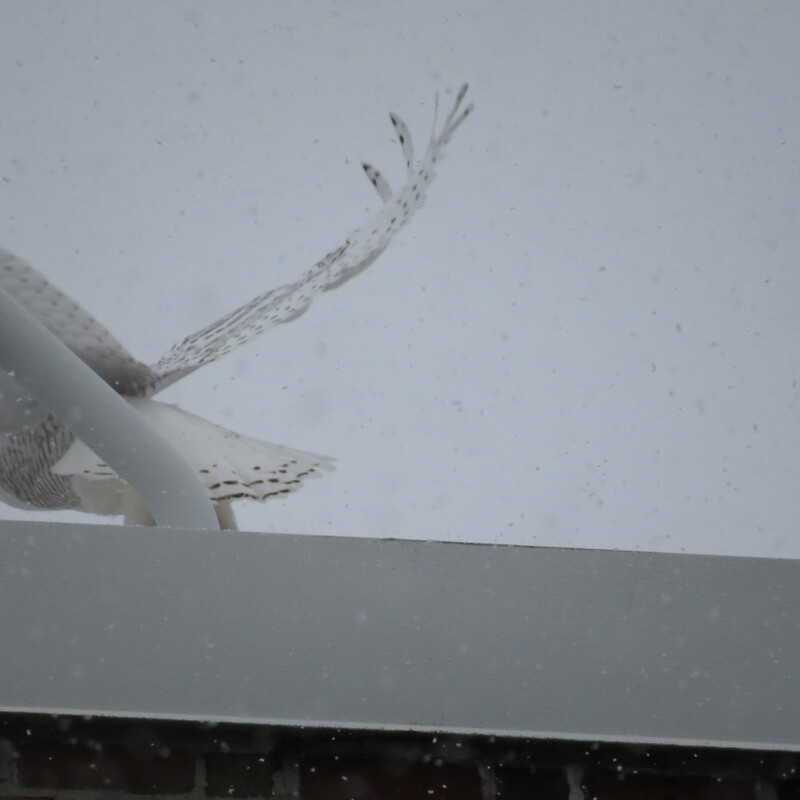 … and did what birds usually do when planning a hasty takeoff. (No, I did not take a picture of that.) And in a heartbeat, too quickly for me to follow with the camera, he took off. So what’s a CBC, anyway? Why, the great Christmas Bird Count, of course! A bit of history, first: back in the good olde days, after after the traditional roast goose, plum pudding and other indigestible delights, the men would gather for the Side Hunt. (Your side against mine, you see.) And the point of this hunt was to blow away every bird you could hit — game birds, song birds, birds of prey, for all I know Aunt Sadie’s canary, if you could hit it. At the end of the day, whoever had the biggest pile of mangled feathers was the winner. But on Christmas Day, 1900, a new idea was born. Ornithologist Frank Chapman made the radical suggestion that birds could be counted by teams covering a designated area, performing the avian equivalent of a census. That humble beginning of 27 birders has grown to tens of thousands across the Americas, establishing over a century’s-worth of range, habitat and population records. And it sounds like fun, too. Well, if we’d gone out Monday as originally planned, ‘fun’ is not the word I’d choose. But Thursday is supposed to be somewhat sunny and above freezing, and the roads are mostly clear. 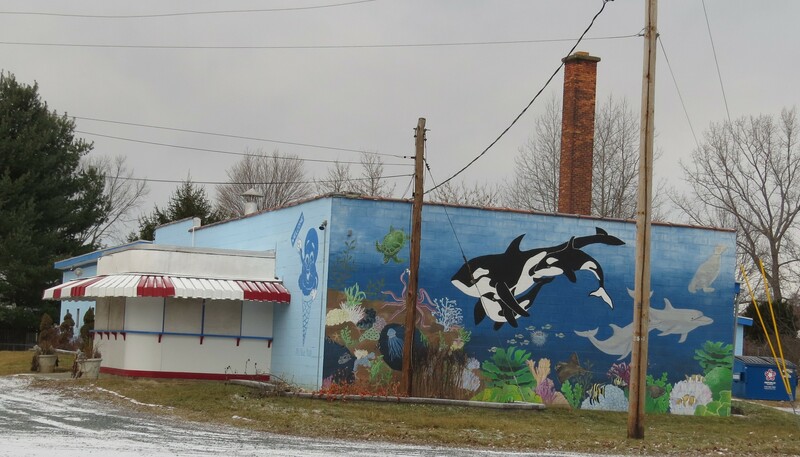 Our section is one corner of southern Rensselaer county, in the towns of East Schodack and Nassau. Too bad I live just out of the area, or we could just look out my kitchen window and count all my regulars, plus the Snow Buntings that are still showing up at the farm. “Come, Watson, come. The game is afoot!” (or aflight, as the case may be.) Here’s hoping for clear skies and great sightings!